Playing Time: 60 - 90 min. Before the Cuban revolution the conditions in Cuba were a bit rough. The board game Cuba lets you experience what it may have been like to live in Cuba and try your best to trade your goods on the market. You'll be doing your best to manage your goods while sending people to the courts, selling goods on the market, and building other important city buildings. The game Cuba is great for teaching teenagers about the world and how things work in the open market. 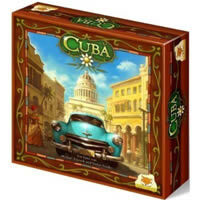 Check out Cuba for a fun game and a great teaching tool. Play the game Cuba today! See the Cuba game rules and instructions. Please keep in mind that the official Cuba board game rules and instructions could be different depending on the game version you have. The rules below are some of the exact directions on how to play Cuba. Share with us your comments, funny stories, tips, advice, strategies, creative ways to play, questions about how to play, problems with the rules or anything you want about Cuba. All submissions will be reviewed within 24 hours. Click here to add your Cuba comments.